This recipe originated from Donna Hay Magazine. I made it tonight, and it was delicious. I did a few modifications, but this is one of the healthiest soups I’ve seen! 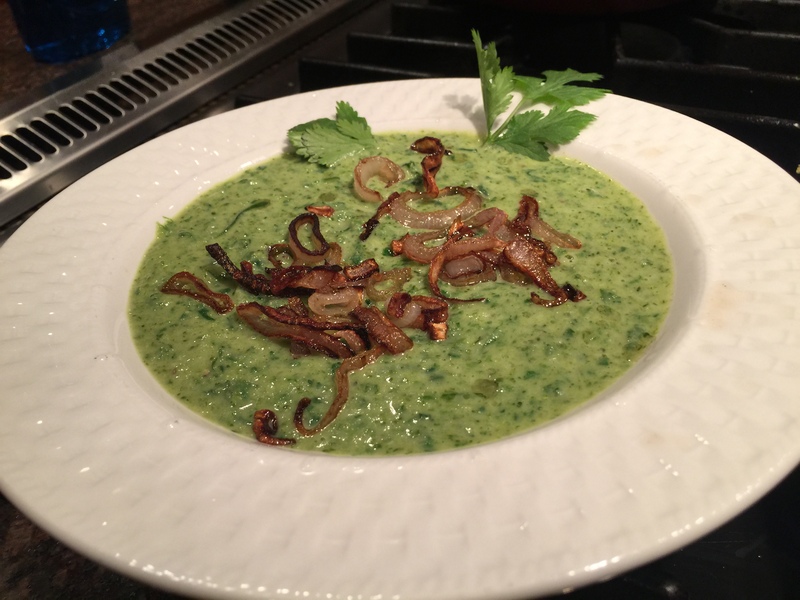 Cilantro is a GREAT detox herb, and gives great flavor to this soup. If you HATE cilantro, leave it out or switch to flat leaf parsley. We made a supper of this soup, wheat free crackers, babaganoush, hummus, olives, and some fig flavored goat cheese. Easy and done! Place the green curry paste in a medium saucepan. Cook for a minute under medium heat until you can smell the spices. Add the can of coconut milk, the water, some salt (1 tsp to start), some cracked black pepper and bring to boil. Add the broccoli, cover and cook for 10 minutes until tender. Remove the saucepan from the flame and add the spinach and 1 – 2 cups of the cilantro leaves. I used 1½ cups. Using an immersion blender, carefully begin blending. If you do not have one, you can use a regular blender but do it in small batches, and with a towel over the top in case the heat pops the top off. Be careful! The immersion blender is good because it doesn’t puree things down to nothing. Place the coconut oil in a skillet, add the shallot slices and cook until crispy. Taste the soup: does it need a bit more salt? pepper? is it too mild? add more green curry paste (tiny bits!) and re-blend. Ladle the soup into bowls, add the shallots and a few sprigs of cilantro.